Great Service... well laid out website... I like the choice of product in every price range & quality. Thanks Heaps... will buy again! 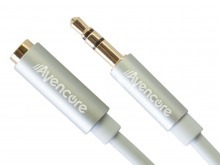 1m Avencore Crystal Series 3.5mm Stereo Audio Extension Cable + FREE SHIPPING! Lengthen any 3.5mm audio cable or AUX jack with this sleek, low-profile male-to-female extension cable. This male to female 3.5mm stereo audio extension cable is the perfect compliment to your home theatre system, computer audio system, car speaker system or any other entertainment system with regular stereo jacks. Extend your headphones for greater reach, or simply place a socket somewhere more convenient than down behind bulky hardware - the option are limitless. Enjoy stylish connections in a range of lengths and enjoy all your favourite music and video anew. I received the cables very promptly. And was most happy with the process! Will probably order some headphones when they come in stock.